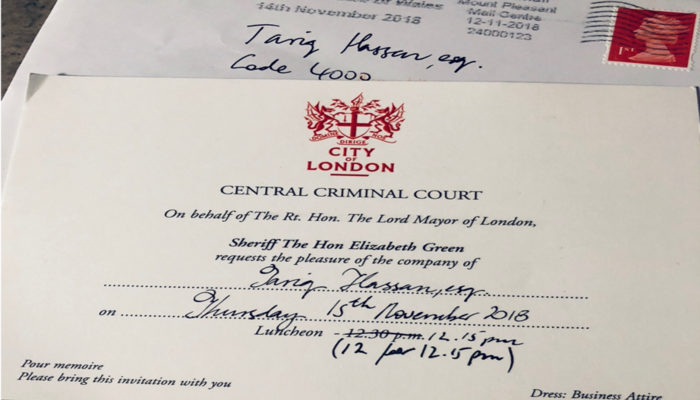 On 15th November Code4000 were invited to the Old Bailey London as guests of the Lord Mayor of London for an event to bring together members of the judiciary, private companies, prison focused charities and several prominent prison governors. The luncheon was served in the hallowed halls of the Central Criminal Court and was an opportunity for focused round table talks regarding all elements of the criminal process and the influence private sector initiatives can have in addressing recidivism. Code 4000 is exactly the kind of pioneering partnership that we need to encourage. It brings together prisons, businesses and teachers to address the country's demand for digital skills and local regeneration, and giving prisoners relevant employment and a new future. To give ex-offenders the confidence and skills they will need to get a job - and critically keep it - we need to engage prisoners in work experience and training in custody which accurately reflects the employment market in the communities they will return to. For the first time Code 4000 gives those in our custody the opportunity to engage in a training programme to become the ‘coders’ of the future. Having been deeply impressed after visiting The Last Mile prison rehabilitation program at San Quentin Prison in San Francisco in 2013, I was delighted to be introduced to Michael Taylor, who had aspirations to create a similar programme in the UK. Since that time, Michael has shown vision, creativity and tenacity in launching Code4000 at HMP Humber. I hope that he will continue to receive the support from the prison estate to extend this vital initiative across the country. COPYRIGHT 2018 Code 4000 UK C.I.C.